George Brown College is one of Ontario's largest postsecondary community colleges fully recognized and accredited by the government since 1967. 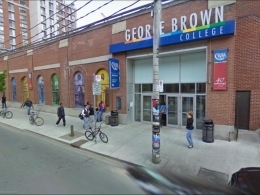 Located in Toronto’s downtown core, George Brown College (GBC) is woven into the cultural and economic fabric of one of the most diverse cities in the world. The college is surrounded by the largest employer community in the country (one of the largest in North America) and offers more than 140 career-focused programs. Designated a polytechnic, George Brown College is a degree granting institution and in addition to our certificate, diploma and postgraduate programs. Diploma/Post-graduate programs: Base tuition fee $13,520 for 2 semesters / $20,280 for 3 semesters. Degree Programs: Base tuition fee $16,500 for 2 semesters. *Tuition fees do not include incidental fees for student ID, Student Association, alumni fee, technology fee, mandatory insurance etc. The approximate average incidentals fee is $1000 per academic year. George Brown College is built right into the city of Toronto, Canada’s largest city and perhaps the most diverse city in the world. It is the epicentre of nearly every major industry in Canada and one of the most important economic hubs in North America. As such, the city becomes a living lab for our students. The College has two main campuses and several other downtown locations that place students right where the action is. Business students study just steps from Bay Street, the financial hub of the country. Nursing and healthcare students are minutes from Canada’s highest concentration of research and teaching hospitals. Arts and Design students learn amidst theatres, galleries, studios and agencies. Most programs begin in September or January. Applications are processed on the first-come, first-served basis. Many programs fill quickly, so we recommend that you apply at least six months in advance. However, applications received closer to the start date will be considered if there is space available in the program. Dates and tuition are subject to change, for the most up to date information please confirm on the college's website. Electronic submissions are accepted, but all application materials should be sent in one package. Otherwise, the processing of your application will be delayed.